Oak Ridge National Laboratory scientists have developed a crucial component for a new kind of low-cost stationary battery system utilizing common materials and designed for grid-scale electricity storage. Large, economical electricity storage systems can benefit the nation's grid in numerous ways: balancing loads between peak and off-peak demand times; supplying energy during outages; storing electricity from fluctuating sources like wind and solar power; and accommodating extreme fast charging of electric vehicles. The grid chiefly relies on hydropower facilities for energy storage, although stationary systems using lithium-ion batteries are increasing. However, lithium is expensive and mostly sourced from countries outside the United States. Some utilities have been testing redox flow battery (RFB) systems that are a cross between a conventional battery and a fuel cell. RFBs are well suited to grid applications because they are durable, long lived, easily scalable, and have a quick response time. However, most of the RFBs being tested today rely on a water-based (aqueous) system, which lessens the amount of electricity that can be stored—also called energy density. A nonaqueous flow battery that uses common, low-cost materials in place of water and can store larger amounts of power in a smaller volume has been a top priority for battery scientists. One of the stumbling blocks has been the development of a suitable membrane to separate the positive and negative electrolytes in the battery while allowing the transfer of ions. 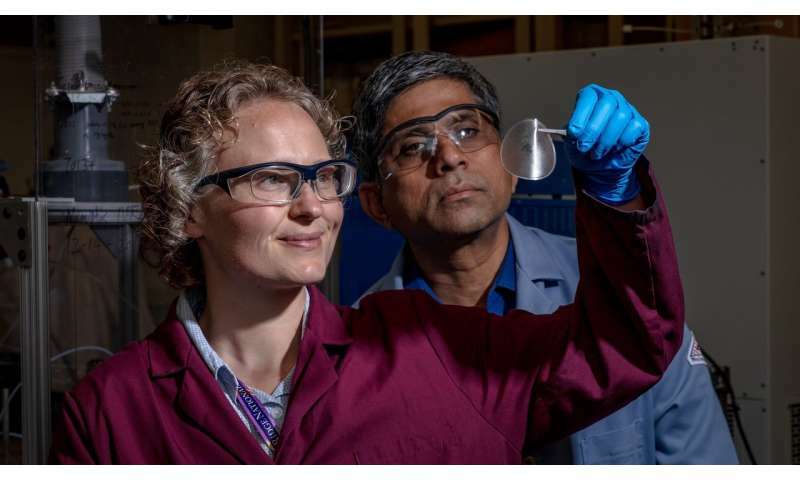 ORNL scientists have now developed a membrane for a sodium-based, nonaqueous RFB that could double or triple the energy density typically seen in aqueous-based RFBs. The work is being funded by the Department of Energy's Office of Electricity and its Energy Storage program, and by lab-directed funding at ORNL. The membrane is made of a common, low-cost polymer, polyethylene oxide (PEO). Its conductivity was enhanced by a whopping 100-fold with the addition of a plasticizer: tetraethylene glycol dimethyl ether. However, the blend also reduced the mechanical strength of the membrane. To offset that effect, the scientists blended the PEO with carboxymethyl cellulose—another common, safe material often used as a thickener in the food industry. The combination of all three substances results in a very durable membrane that is expected to function well in high-energy batteries. "Nonaqueous redox systems operate at high voltage, enabling higher energy density. 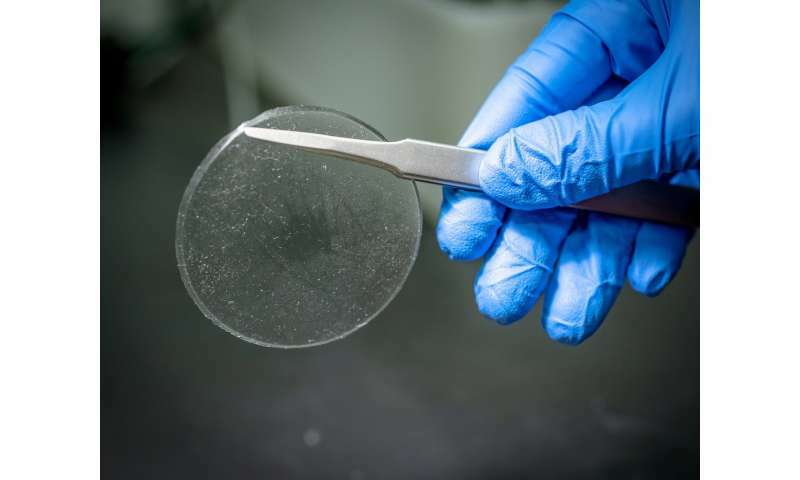 But the key is to attain high energy density without any cost penalty," said Jagjit Nanda, the project's principal investigator in ORNL's Materials Science and Technology Division. Rose Ruther, a collaborator in the Energy and Transportation Science Division, said "this is really about the chemistry of the system and understanding how it all links together and why we're getting this big enhancement in conductivity with the membrane." The research is detailed in a journal paper, "Low-cost, mechanically robust, sodium-ion conducting membranes for nonaqueous redox flow batteries," recently published in ACS Energy Letters. "There is a huge push to find energy storage solutions for the grid. Large energy storage systems can be a very expensive proposition," Ruther said. "Cost scales with size, so if we can increase energy density, that can result in a big savings." "The holy grail is a system that does not use scarce, expensive resources and has a higher potential for commercialization at a lower cost" than current battery technologies, Nanda said. "The weakest link in the system is the membrane, and we have made progress to resolve this issue with this new, low-cost prototype." The next step in the project is to further develop the membrane to make it more selective in preventing the crossover of counterions and to improve its mechanical flexibility and robustness.